It is Skipping Stones Sketch Tuesday, folks! YAY!!!! If you happen to be new around here, every Tuesday Skipping Stones Design puts up a new sketch. We, the design team, create inspiration cards based on that sketch using FABULOUS Skipping Stones stamps and then we give YOU homework! Yup. That's right. The good news is...it's wicked fun homework! We want to see YOUR interpretation of the sketch! You don't have to use SSD stamps, but we LOVE to see them if you have them! *sigh* This card makes me happy! I LOVE these colors!!!! I used the Rustic Tiles stamp set (on sale this month!!!) and Momento London Fog ink. And, as you may already know, Skipping Stones has partnered with Creative Impressions this month and THAT, my dear friends, is where that fabulous red ric rac hails from. I kinda love it. Just say'n. The sketch was created by the fabulous Chan Vuong. And you totally want to create a card based on it. Just say'n. See? I totally told you that you'd want to use this sketch. So DO IT!!!! Make a card or a layout or a tag or some other fabulous project based on this sketch. Use any supplies you have on hand. And then get your little backside on over to Skipping Stones Design to link it up! Why? Because you could win FREE STAMPS, that's why!!!! K. Link up. Do it. It's for your own good. K. Bye now. Thanks. And stuff. Looovvvveeeee it!!! Clean lines and classic colors get me every time! This card make me happy to- I seriously love it so much! It is absolutely perfect!! That card is ELEGANT! I always SAVE the designs, but I just never seem to get to MAKE THE CARDS. Someday. In the meantime, I'll enjoy YOUR cards & the cards from the other lovely artists! HUGS! How could I not be happy visiting here! It starts with the cute header pic then your profile photo and the fun stuff you create and share! 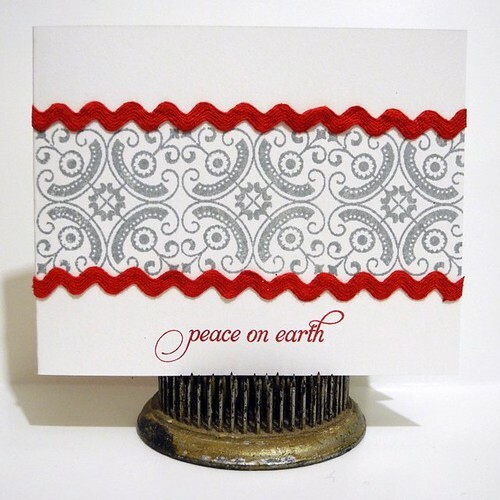 The Peace on Earth card is lovely and the grey and red are just right as well as the pattern and zig-zag of the rick-rack. Sweet! I love the stamps and you can't get much better than red and grey! Such a pretty card and so classic too. I love the rickarack...adds so much to this already cute card. That red and gray combination is so beautiful and sophisticated. Thank for sharing your card. I like the sketch too. Love your card Jen. Such a classy holiday card. Oh my goodness....You know I love this card. I can't stop looking at it. Great job! Love the card too~I love simple too!!! 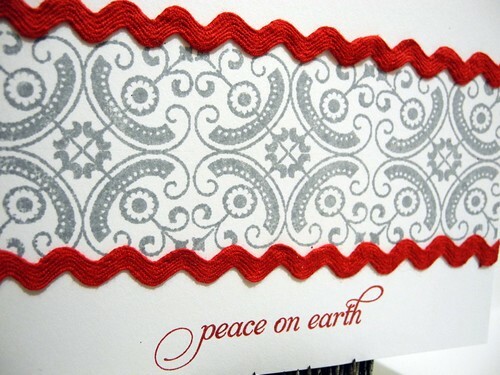 I love the simplicity and colors of this card. Beautiful! LOVE this card! :) Love the colors, the simplicity, just LOVE! Great job! This card makes me happy too! Love your color combination, and the ric rac too. I can see why you love it. It's beautiful! Love the simplicity...the gorgeous colors...everything. It's perfect. prefectly elegant card Jingle! So classy and chic! Love it! Wow! You have quite a talent with paper! The card is so beautiful and a love the stamp that you used! We are having a Home for the Holidays party on our blog and our readers would love to see this! Take care! Jingle..........I just love reading your posts!!! And.....I love looking at your awesome cards! Love the colors you chose this week! Great puppy dog eyes. And a great card too. Just sayin.